Shawn Mendes considers Pinoys \"one of the loudest crowds\"
Shawn Mendes tells Pinoy fans: "I've heard you're one of the loudest crowds in the world"
Shawn Mendes performed his hits "Treat You Better," "Mercy," and "Sticthes" during his Handwritten Tour Manila concert at the SM Mall of Asia Arena on March 18, 2017. The Canadian pop singer promised his Filipino fans: "I'll come back soon!" It was a long time coming, but Shawn Mendes definitely made it worth the wait. The 18-year-old Canadian pop singer serenaded his Filipino fans at his sold-out solo show in the Philippines on Saturday night, March 18, at the SM Mall of Asia Arena. There were several events happening at the Mall of Asia complex that day and the heavy traffic was out of this world! Still, some of his fans came in early before the show's scheduled time at 8 p.m. Even before the concert started, Shawn's fans, also called Shawn's Army, were singing his hits being played on loop inside the concert venue. A few minutes past 8, the lights started to dim and the crowd screamed at the top of their lungs upon the singer's entrance on stage. Shawn's concert was divided into three parts. His first act was mostly for acoustic performances starting with "Something Big" and "The Weight." At one point of the concert, he recalled his visit to Balite Falls in Cavite and admitted that the experience was very special to him. "So, the other day I went out to a waterfall a couple of hours away from Manila. And, I had the most incredible experience with these two little girls out there. "Now, I've never been to the Philippines and it's a world away from me and to go two hours away to a waterfall where there's a bunch of people docking out these rocks into the water, to show up and for them to recognize me and to know my music was the most incredible thing I've ever experienced in my life. "It's just amazing, I don't know what I'm talking about right now but I'd like to tell you guys that that was really special to me." Before his next number, Shawn expressed his gratitude to those who are able to relate to his songs. He said, "When songwriters write songs, we just wanna create, in that moment, create something that is very important to us. But when we're doing that, we sometimes don't realize how these songs become to other people across the entire world. "And there's been this one song that no matter where I am in the entire world, people seem to connect to it and always talk about [it]... And that's really incredible to me." After this short message, he continued with his performance of "A Little Too Much." The crowd sang along upon hearing the first few lines of his chart-topping hit titled "Treat You Better." The concert continued with his performances of "Lights On" and a medley of songs from his latest album Handwritten. He ended his first act with an emotional rendition of the song "Ruin." Before his performance, he asked the crowd, "Can everybody do me a favor and take their phone lights out on this one." His fans quickly obliged to his request and lit up the whole arena with a sea of light. The second part started with his performance of "Three Empty Words" which Shawn noted was the "closest song to his heart." "I've heard you're one of the loudest crowds in the world," Shawn told his Filipino fans after hearing about it from British singer Ed Sheeran. This prompted concertgoers to scream their loudest once more. Shawn continued his concert with performances of the songs "Patience" and "Don't Be A Fool." Towards the end of the concert, Shawn belted out another fan favorite titled "Mercy." This was followed by another ballad titled "Never Be Alone" which marks the end of his set list. The lights went dim but the fans didn't know that Shawn's next performances were for the last part of his concert, his encore. 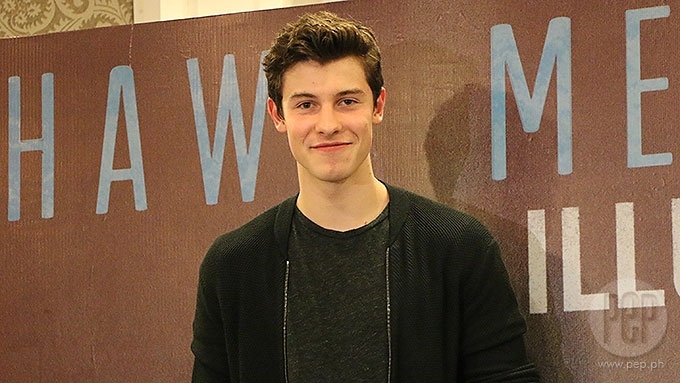 Shawn went on to deliver a piano version of his earlier hit titled "Life of the Party." He invited his fans to sing with him and said, "Beautiful! Keep on singing!" Shawn finished his concert with the highly anticipated performance of his mega-hit titled "Stitches." His performance started out on a piano and ended with him rocking his finale. The Canadian singer's exit was kind of abrupt, leaving fans expecting for an encore performance. Before leaving the stage, he promised his fans, "I'll come back soon!" The lights went on and crowd stayed for a few more minutes chanting, "we want more," hoping that there was more.